Here is a former GN steam engine tender, now used as a water car behind the Reading #2100 4-8-4 steam locomotive. 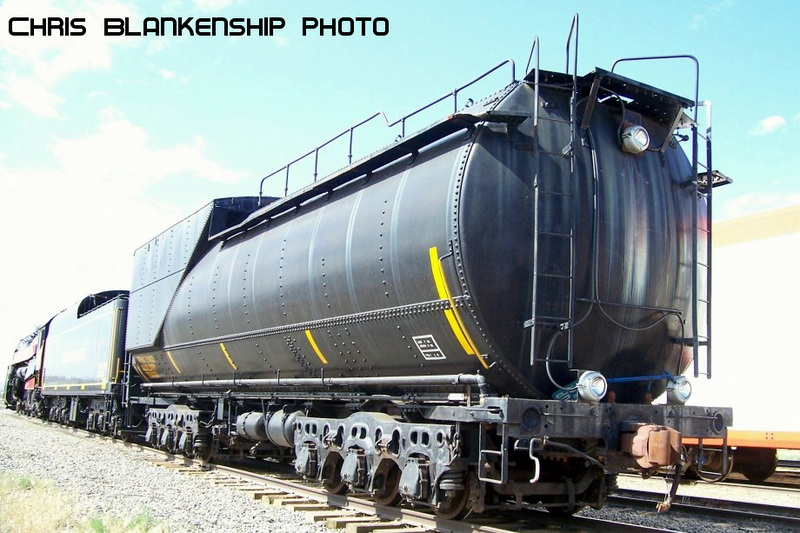 Photo taken in Richland, Washington by Chris Blankenship. GN 4688 - In the Totem Lake area of Kirkland, WA (along the route of the Spirit of Washington Dinner train) can be found TWO ex-GN boxcars in Big Sky Blue. Both are off their trucks and used as sheds. 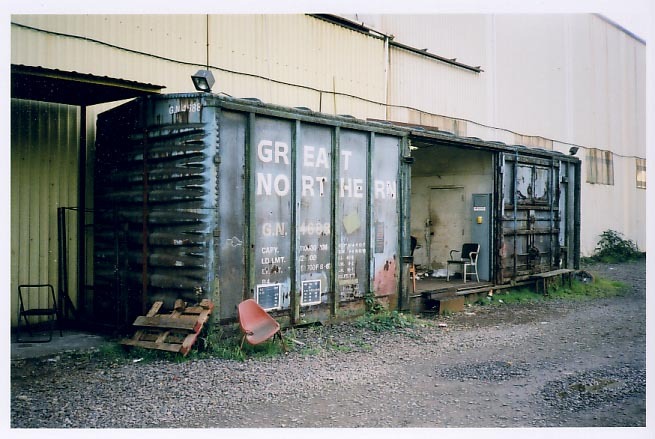 These box cars were never given BN reporting marks (the 4688 car has a white line through the GN number). October 2003 photos by Lindsay Korst. 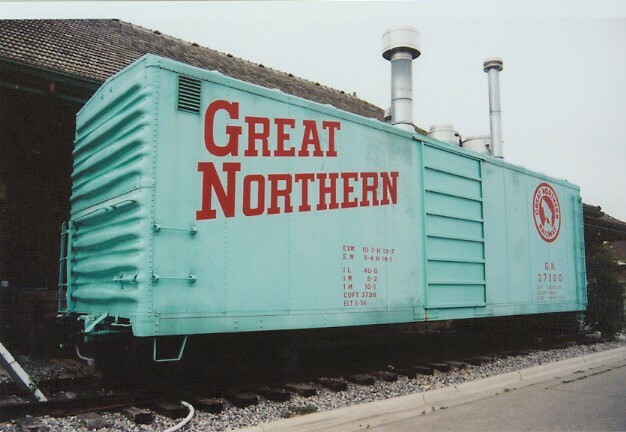 GN 27100 box car painted up in Glacier Green paint scheme. Next to Fargo, ND ex-GN depot. July 2003 photo by Lindsay Korst. GN 174293 Wood Chip car logo with "Rocky Lives" stencil. May 2003 photo by Robert Ulberg. 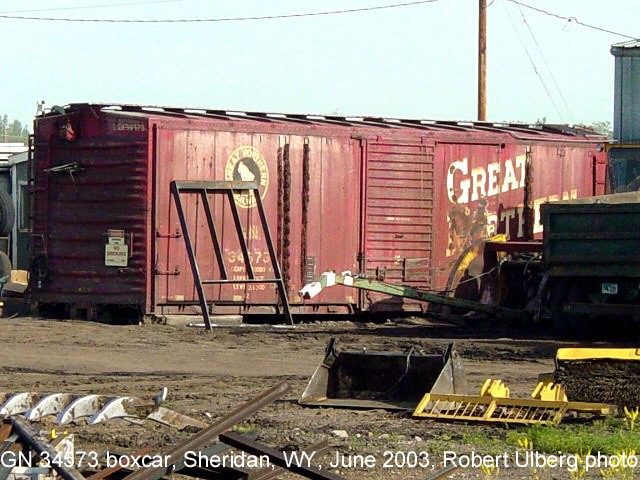 GN 34573 boxcar used as storage shed, Sheridan, WY. June 2003 photo by Robert Ulberg. 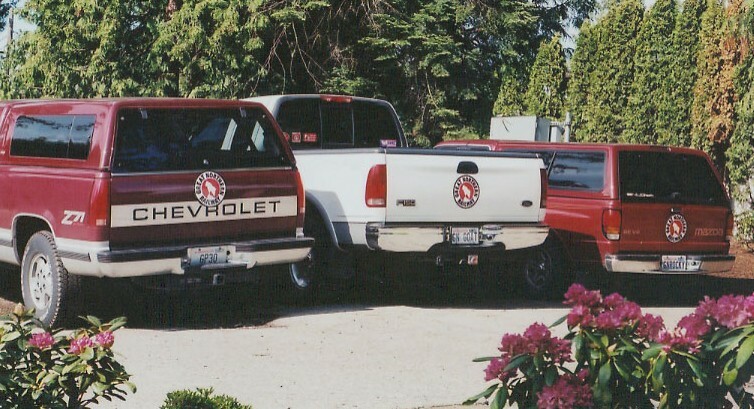 From left to right - "GP30" owned by Gary Muehlius, "GNGOAT" owned by Lindsay Korst and "GNROCKY" owned by Scott Tanner. Photo taken May 2003 by Lindsay Korst. 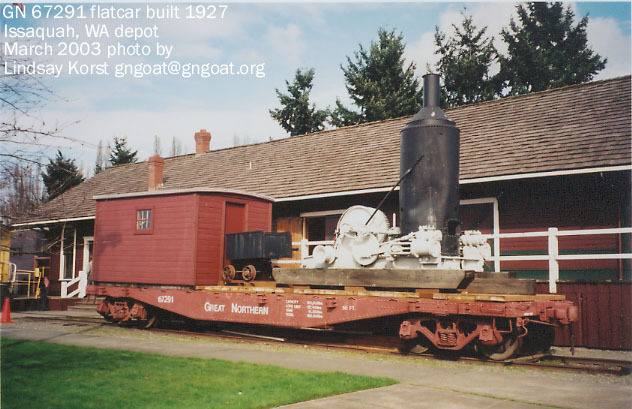 GN 67291 - A flatcar built in 1927 resides outside the ex-NP Issaquah, WA depot. 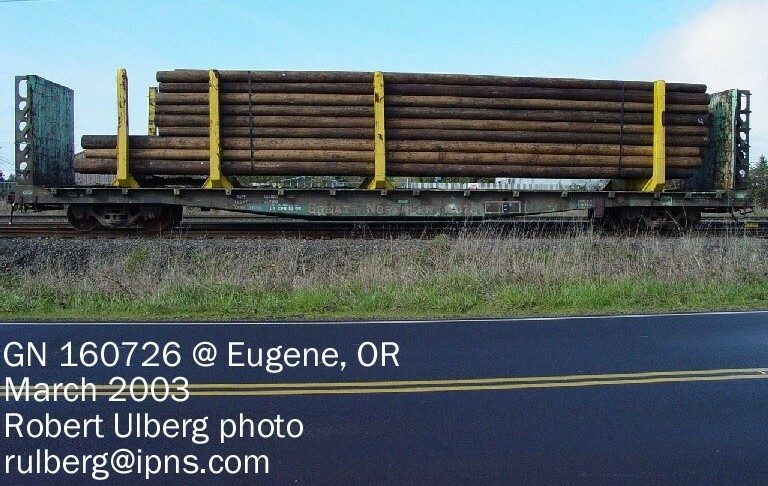 Photo taken March 2003 by Lindsay Korst. 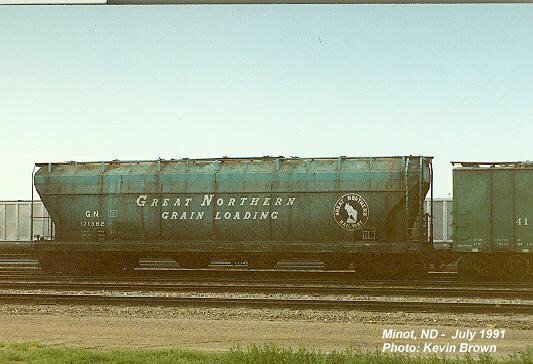 GN 160726 - Still carrying the Great Northern name and wearing Glacier Green paint more than 30 years after the merger is this bulkhead flatcar. Photos taken March 2003 by Robert Ulberg. 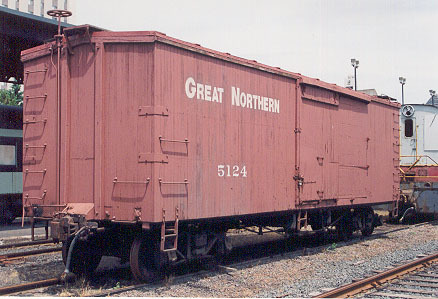 GN 174303 - The above wood chip car was built by Gunderson Brothers in 1968 for the GN. It was photographed Saturday, March 21, 1998 at Forsyth, Montana. Photo taken by Ron Gebhardt. 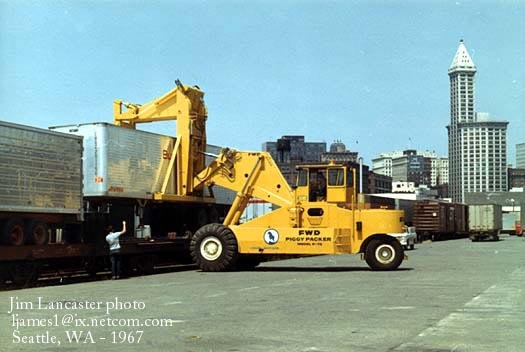 GN 200109 was built by Pacific Car and Foundry in 1966 for the GN. Despite 33 years of service it still retains its original number, logo and markings. It was photographed September 10, 1999 at Havre, Montana. Photo taken by G. Pat Roche. 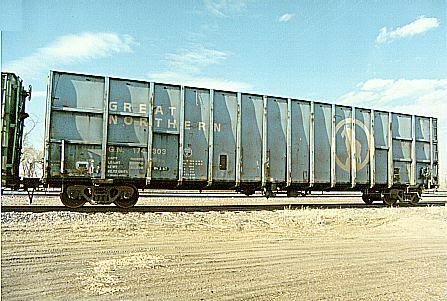 GN 171382 is a 54' long covered hopper built by AC&F in 1965. 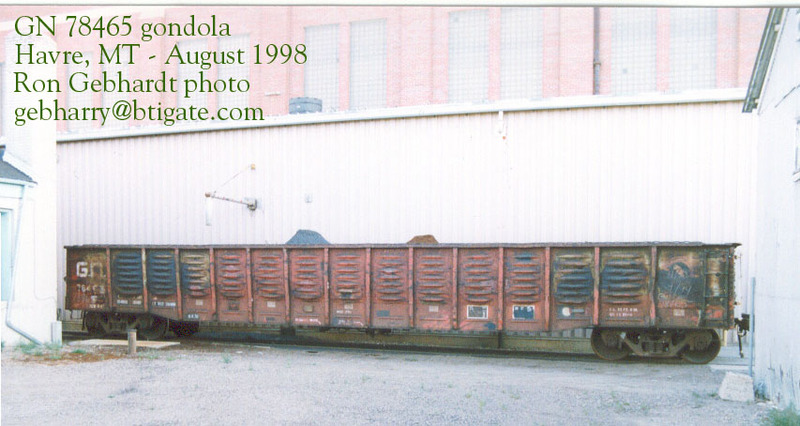 Photo taken by Kevin Brown in Minot, ND in July 1991. 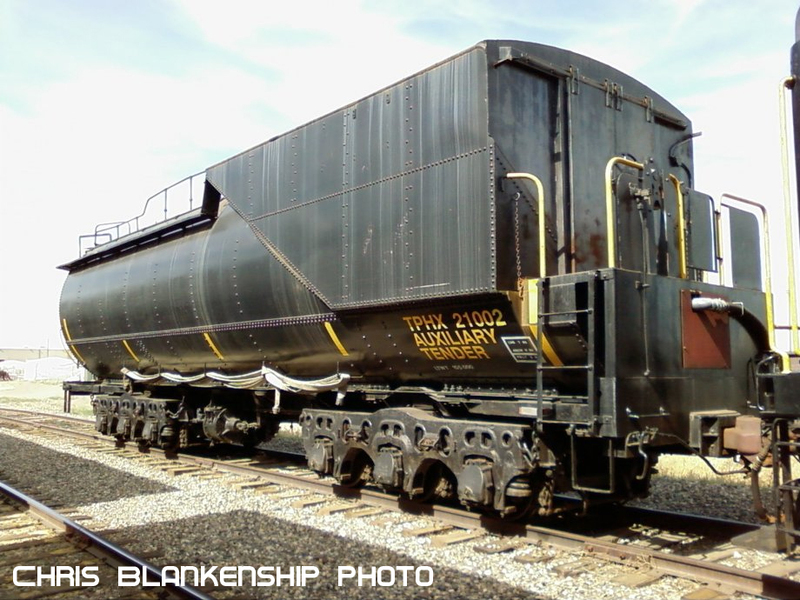 GN 70223 is a 43' long hopper car built by Pullman-Standard in 1957. 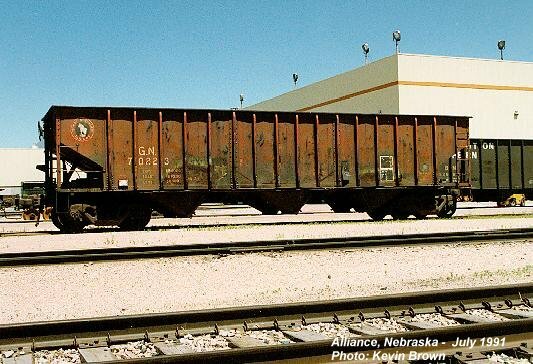 Photo taken by Kevin Brown in Alliance, NE in July 1991. 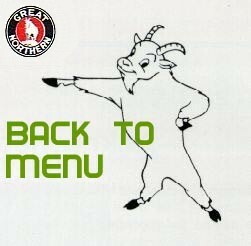 GN 26?? 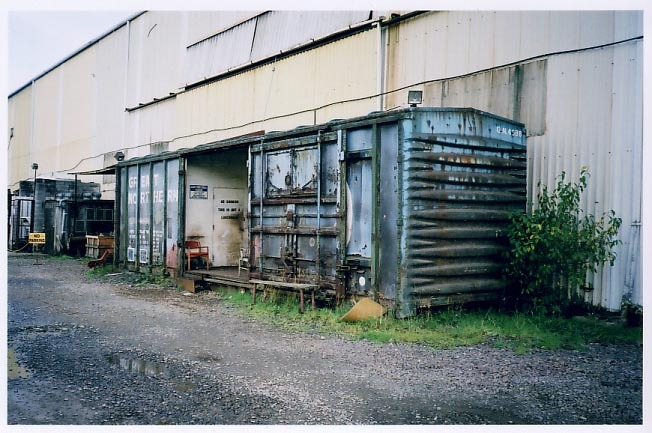 is a former Storage Mail Express car. 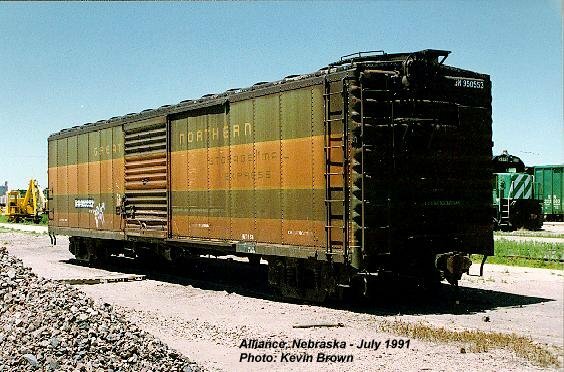 Photo taken by Kevin Brown in Alliance, NE in July 1991. 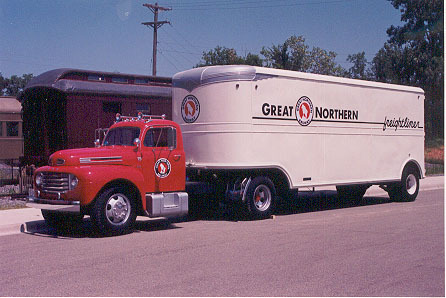 GN 137073 is a 50' plug door boxcar built in 1970. Photo taken by Janet Roche in Kremlin, MT on September 23, 2000. 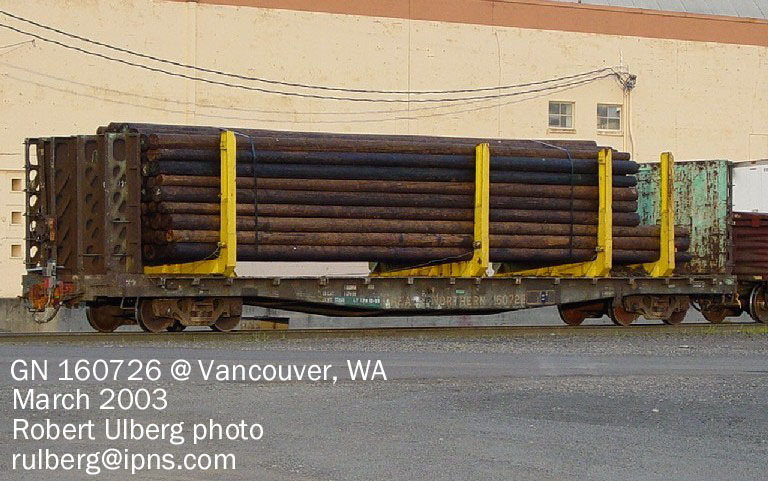 A GN "PiggyPacker" unloads trailers from a GN train in Seattle, WA. Photo taken in 1967 by Jim Lancaster. 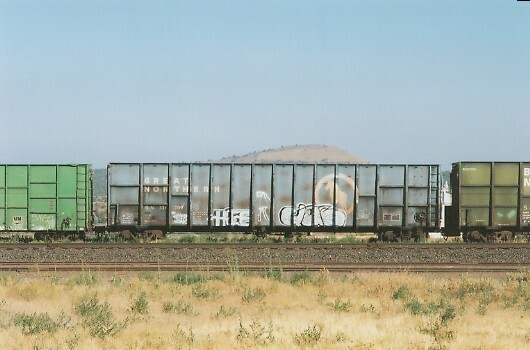 GN 78465 gondola at Havre, MT, August 1998. Photo by Ron Gebhardt. 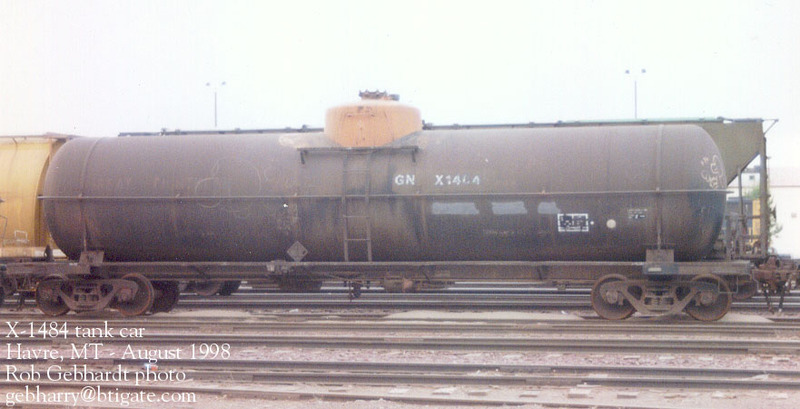 GN X-1484 tank car at Havre, MT, August 1998. Photo by Ron Gebhardt. 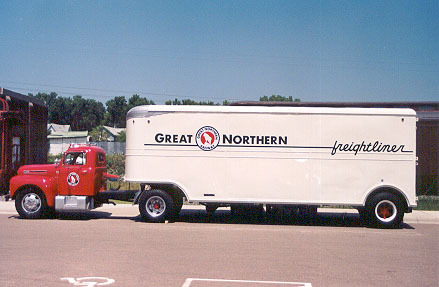 John Robinson's restored GN Freightliner truck at MTM Jackson St. Roundhouse. Photos taken by Lindsay Korst in July 2001. 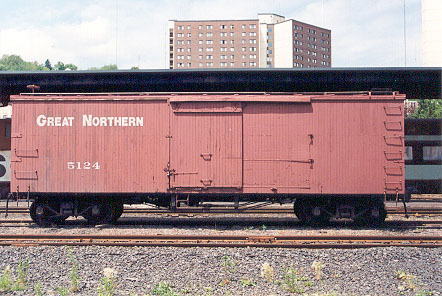 Very old GN boxcar #5124 at Lake Superior Transportation Museum in Duluth, MN. Photos taken by Lindsay Korst in July 2001. 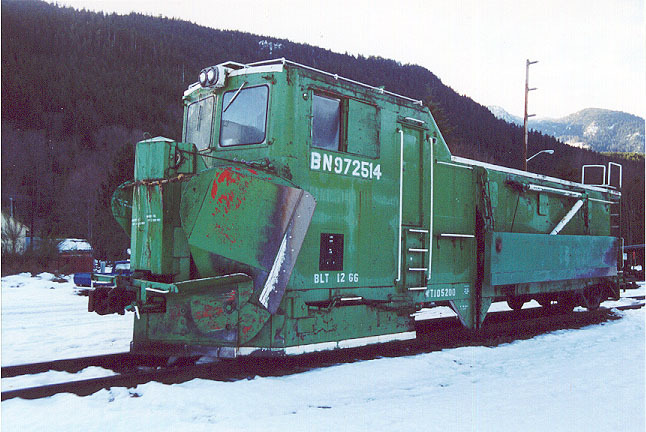 Ex-GN snow dozer rests between assignments at Skykomish, WA. That's genuine GN vermilion red on the plow blade. Photos taken in December 2001 by Lindsay Korst. 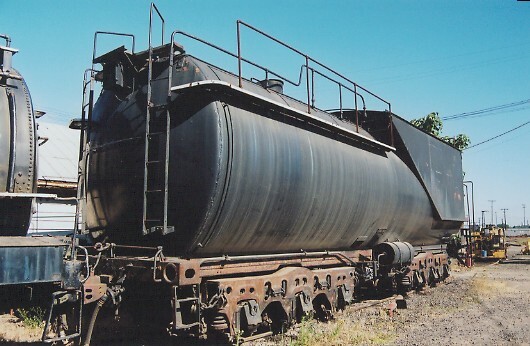 Ex-GN Vanderbilt tender at SP Brooklyn roundhouse. Photo taken by Lindsay Korst in July 2002. GN 174384 Wood Chip Car along the OT, Metolius, OR. Photo taken by Lindsay Korst in July 2002. 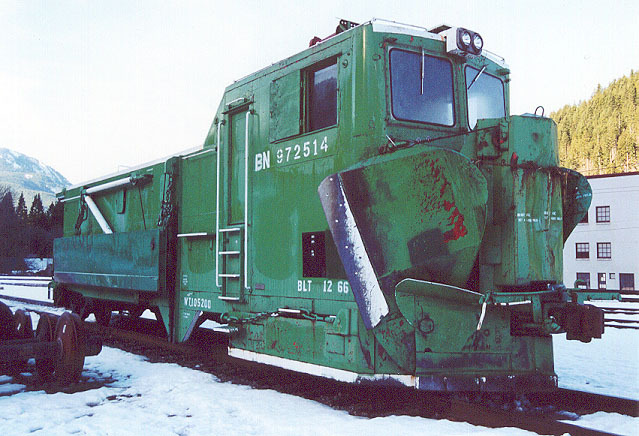 BN 972813 ex-GN snow dozer at Sandpoint, ID. Dozer is clearly labeled "Built St. Cloud Shops GNRY 12-66". Photo taken by Lindsay Korst in July 2004. GN 174497 wood chip car on local train, Naples, ID. Photo taken by Lindsay Korst in July 2004. GN 174379 wood chip car on siding, Gold Bar, WA. Photo taken by Lindsay Korst in June 2004.